Thank you to Tasting Panel Magazine for the write up about us in their latest July issue! It was such a pleasure to share the evening with Meridith May and Bill Brandel of Somm Journal/Tasting Panel Magazine as well as the sommeliers Mike Madrigale of Boulud Sud & Bar Boulud (New York City), Paul Coker of St. Regis Monarch Beach (Dana Point), and Jared Hooper of Faith & Flower (Los Angeles). These gentlemen are so cool, by the way, that I wish I had had more time to just listen to them. We feel so blessed to have had them taste through some of our wines and hear our story. Also, a thank you to Doug Young for covering the dinner with his camera skills (it admittedly was tough for this photographer to sit still). The delicious dinner was in May during the media week of the CAB Collective and the setting was the beautiful Thomas Hill Organics in Downtown Paso Robles. The dinner highlighted our wines perfectly. 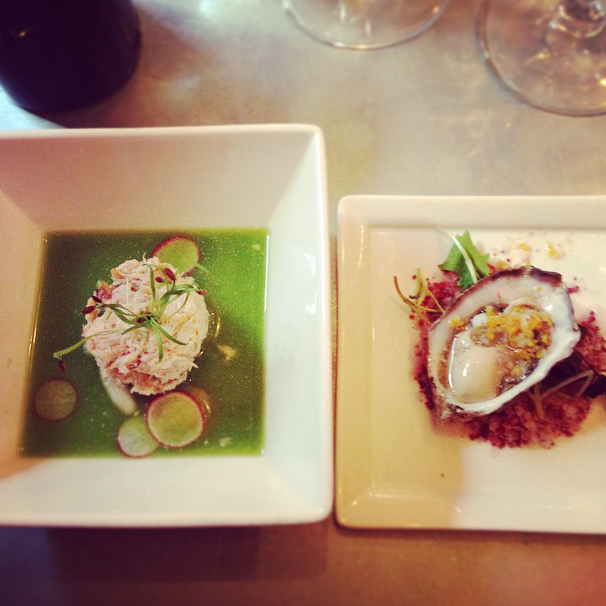 From a delicate hors’d crab salad floating in cucumber water with shaved radishes and a oyster half shell laying in a bed of infused Silken Blanc salt served with our 2013 Silken Blanc to an entree of cocoa crusted venison with vanilla scented creamed potatoes served with our 2012 Petite Sirah, the dinner was stellar to put it simply. We even had a party crasher as Linda Parker Sanpei joined us, so it must have meant the wine and food was good! 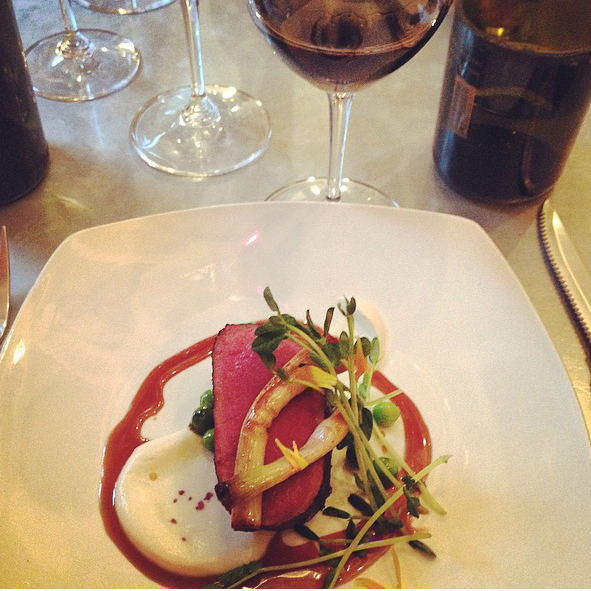 We are thrilled that the 2012 Petite Sirah would receive such a lovely description and 94 point rating from Meridith…. She perfectly describes what this wine is all about and it delivers a wonderful experience. It also recently received a Silver at the San Francisco International Wine Competition, so we couldn’t be prouder. It is available at the tasting room and online. In the end, the article showcases that Paso Robles is up and coming. We have a lot of great things happening in our area! I am excited to see what things will continue to grow and what things will hopefully continue to stay the same to represent our heritage. For instance, we have wonderful wineries, restaurants, shops, and galleries. We are growing, but then we have hometown things like Concerts in the Park and the Lavender Festival that I hope continue to only age with beauty. Again, a thank you to the Tasting Panel Magazine as we are truly humbled by this story and the time you took to share with our family. A big thank you to Debbie and her team (Lannon) at Thomas Hill Organics. And lastly,Chris Manning for his culinary talent. 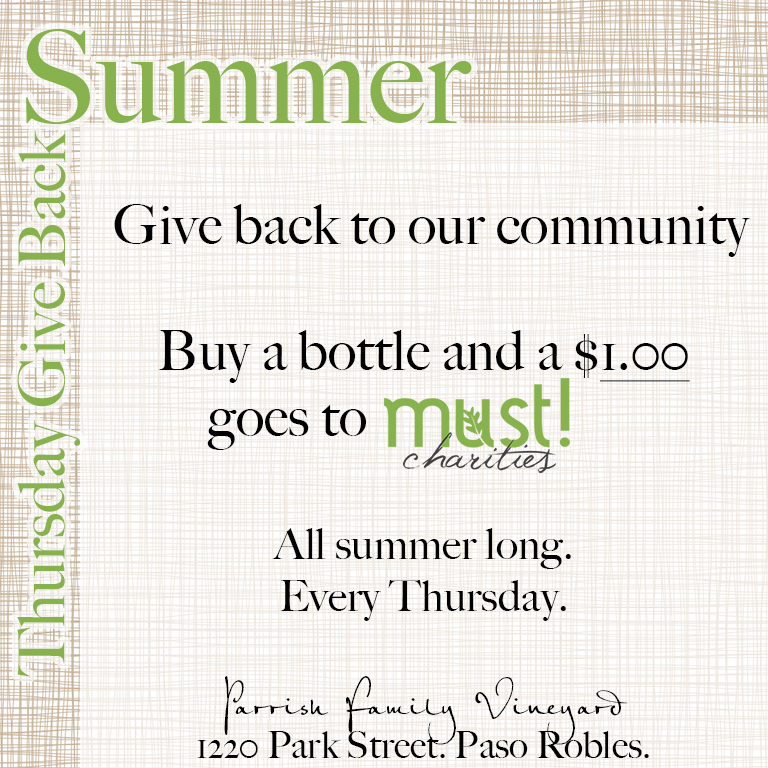 Give Back Thursdays for Parrish Family Vineyard is all summer long on every Thursday! Every bottle sold means we’ll give a $1.00 to must! charities. So, stop by and help us support our community! Next Thursday will be our 1st Third Thursday with Must! Charities and we are very excited! So what does that mean, well, join us every 3rd Thursday of the month where we will celebrate with a fun theme and also give back to the community. Every 3rd Thursday we will give a percentage of our sales for the day to Must! Pretty easy and cool. It gives customers and us the ability to support our local community’s needs. So, stop by next Thursday, July 17th, as we celebrate Paso’s 125th Birthday with Zin Brownies, since Zinfandel was the 1st grape in Paso. Enjoy wine as usual and make purchases to help support Must! Charities. Also, be sure to shop around a bit as other Downtown Paso Robles businesses are apart of Third Thursdays as well: And Be Boutique, Arroyo Robles Winery, Il Cortile, La Cosecha, LXV Wine Lounge, Salon Roux, and Studios in the Park! The CABs of Distinction Gala and events are coming up quickly on April 25th and April 26th! If you’re busy like me and realize, “OH MY GOSH, we still need to get tickets and lodging!” It’s okay…there are plenty of options in the area for lodging and tickets for the Gala are still available! Adelaida Inn – Quaint and some of the sweetest people. Hotel Cheval – Boutique, gorgeous place and perfect for a special stay. Easy to get around Downtown Paso. La Quinta – Easy to find, great service, and 5 minutes (if that) to the Gala event! Check Out More Hotes in Paso (really, you can’t go wrong with many of them) at TripAdvisor! Paso Robles Vacation Rentals – They have places in town and out in the country. They also have a great selection of 1 to 5 bedroom homes depending on your needs. Canyon Villa B&B – Your’s truly did the photography for this gorgeous B&B, but I also actually stayed here and it is simply amazing! The owners are generous people. The breakfast is delicious (enjoy on the patio is a must). If you want quiet, Tuscany…try here. Lastly, have you considered Atascadero, Cambria, or Cayucos? Yes, a little drive, but they offer great experiences. Atascadero has the beautiful Carlton Hotel as well as the solid Holiday Inn Express and Best Western! Tip…the rates may be better in Atascadero and HWY 101 is not far to accommodate travel! El Colibri – If you want boutique, they will deliver it. Also, rumor has it Lady Gaga stayed here, so why not be like all the cool kids! Sand Pebbles Inn, Blue Dolphin Inn, & Fogcatcher Inn – If you want ocean views and easy access to a lovely boardwalk along the picturesque bluffs of Moonstone Beach, check out these lovely high rated places. Check out more on TripAdvisor! Cass House Inn – Can this place just stop being adorable?! Just check out the photos. I also hear the restaurant is superb. On the Beach B&B – Just met the very friendly owner of this place. This has a central location and not far from the pier (which I believe is partially open), local eateries, or even that big sandy thing (the beach). Pier View Suites – Is another charming place with ocean views! Again, more quaint Cayucos and lodging on TripAdvisor! There you have it…might need a glass of wine after reading all that, but now you have some easy links to places to stay and tickets! Cheers and we hope many of you will join us April 25th & 26th!